Bedford to Kempston Mill Circular Walk at Bedford Walking RouteThis circular walk starts from the County Bridge in Bedford and follows the River Ouse upstream to Kempston Mill. The return section follows the river on the opposite bank through wood and meadowland. Start/Finish Points: Start from The County Bridge, Prebend Street. Start Nat GR: TL045494. 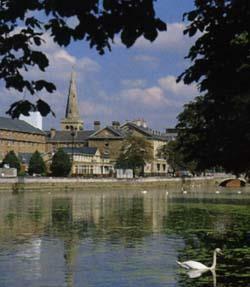 This circular walk starts from the County Bridge in Bedford and follows the River Ouse upstream to Kempston Mill. The return section follows the river on the opposite bank through wood and meadowland. How to get there by car/parking: Bedford is easily accessible from the M1 via the A421 or from the A1 via the A603. Parking is available in short and long stay car parks situated in the town centre.